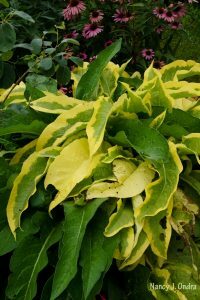 “Going green” is a good thing when it comes to recycling and other earth-friendly activities but not so good when it happens to variegated plants, such as this ‘Axminster Gold’ Russian comfrey (Symphytum x uplandicum). 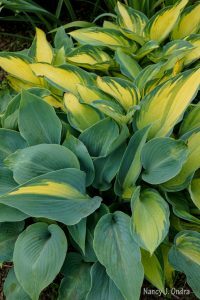 When you choose plants with multicolored leaves for your garden, you expect to enjoy those stripes, spots, and splashes for years to come, and that’s generally what happens. Every now and then, though, you may notice that your variegated plants have turned partly or mostly green. It doesn’t mean there’s anything wrong with them—just that you need to give them a bit of care to keep them looking their best. Spring is a good time of year to take a stroll around your yard and make sure your variegated plants look like they’re supposed to. One way variegated plants can revert, or “go green,” is by producing new shoots that are solid-colored, rather than variegated. This can occur right at the base of a plant or somewhere along a stem. All-green leaves or shoots tend to be much more vigorous than the multicolored parts and will gradually take over, crowing out the weaker variegated growth. It generally takes a few years for a variegated plant to go entirely green, but the longer you let the green parts stay, the more work you’ll have to remove them, so do your best to catch them quickly. If you see just a few solid-colored leaves or a single solid shoot coming from a clump, try pinching or snipping them out as close to the base as you can. Repeat this every few weeks if new solid leaves appear. When there’s more than one non-variegated shoot, use a sharp tool, such as a hori hori knife, to carefully carve out the unwanted parts. 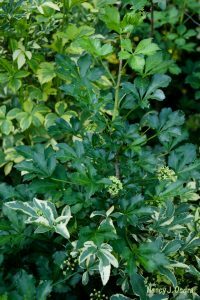 If they’re on the edge of the clump, you may be able to do that without disturbing the rest of the plant; otherwise, dig up the whole clump, cut out the solid-colored sections, and replant the variegated parts. When a shrub or tree produces a solid-green shoot on a variegated branch, follow that shoot back to where you see the correct multicolored growth and snip it off there. If the entire stem is solid green, then remove it at ground level. One more thing to keep in mind: It’s possible for variegated plants to produce variegated offspring from seed, but it’s much more likely that their seedlings will be solid green. Within just a season or two, those all-green seedlings can crowd out the variegated parts. This isn’t technically a reversion of the original plant, but the result is the same: a partly or mostly green perennial where you started with a variegated one. ‘River Mist’ northern sea oats (Chasmanthium latifolium) is worth growing for its spectacular striping, but it can produce lots of solid-green seedlings. 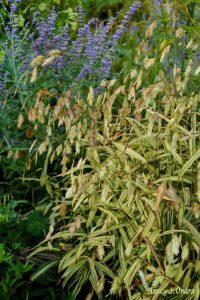 One option is to deadhead (cut off the flowers as soon as they are finished blooming) so they can’t set seed, or at least before the seeds ripen and drop. Or, commit to regular weeding so you catch the unwanted seedlings while they are still small and easy to remove. 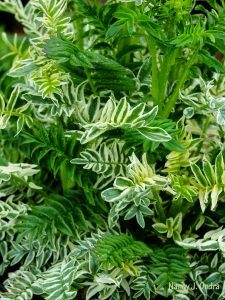 Whether it requires pruning, trimming, or deadheading to do the job, keeping your variegated plants in prime condition takes just a few minutes each year: time well spent in return for the fabulous foliage you’ll enjoy in return.